19/10/2012- On October 18, Mexican President-elect Enrique Peña Nieto ended his European tour with a visit to OECD headquarters in Paris. Peña Nieto met with Secretary-General, Angel Gurria, conducted a press conference and participated in a seminar with OECD experts on topics ranging from the economy to education and environment. Peña Nieto also delivered a keynote address on Mexico’s challenges and its role in a changing global landscape. During his speech Mr. Peña Nieto said “Mexico has built an environment and a favorable scenario that has to be advantaged to trigger further economic growth”. And continued: “My commitment is to work under these two principles: responsible management of public finances and respect of the definitions of the Central Bank, with which we will maintain macroeconomic stability, and it will remain the ideal platform to encourage other actions that allow Mexico to grow economically” (Read the full speech in Spanish / English). Mexico's President-elect also said: “Our vision to transform Mexico has a lot of points in common with the recommendations formulated by the OECD: the need to activate economic growth, raising productivity, increasing investment and creating better conditions for competitiveness.” And concluded: “I’m certain that in the eyes of the world, Mexico is starting a new stage in its history and it will be seen as an example of success in the 21st century”. 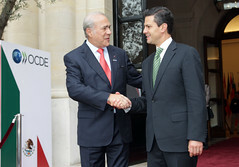 Mr. Gurria pointed out that “the agreement signed by the OECD and Mexico's President-elect a few weeks ago, that compromises OECD support to Mexico in the design of public policies, highlight the urgent need for change in the country. And we pledged to work hard to promote these changes” (Read Secretary-General welcoming remarks in Spanish / English). In a series of recommendations recently prepared by the OECD for Mexico, the Secretary-General underlined that "unlike what happens in many other countries, the new Mexican government will start out with sound public finances, controlled inflation, a growth rate that is double the OECD average, a well capitalised banking system, a network of trade agreements with 44 countries, and regulatory improvements that enhance the business climate. At the same time, the country faces very major challenges in terms of economic competitiveness and social inclusion (...). Mexico needs to exploit this combination of strengths and circumstances to raise its “cruising speed”. President-elect Peña Nieto was accompanied by the General Coordinator for the Transition Government, Luis Videgaray, the Vice Coordinator for International Affairs, Emilio Lozoya Austin, the Coordinator for Economic Policy & Liaison with OECD, Raul Murrieta Cummings, the Mexican Ambassador to the OECD Augustin Garcia Lopez and the Mexican Ambassador to France Carlos de Icaza.